Finally, something truly creepy and scary for Halloween week. At some point during 2000, I read a book called A Twist at the End: A Novel of O. Henry and the Texas Servant Girl Murders of 1885 by Steven Saylor. I’m not entirely sure how I came to have this book because I’m not really one for historical fiction, but once I learned that the book was indeed based on real events, I became obsessed with the Servant Girl Annihilator case. As most friends I had at the time can tell you, I pretty much sent a copy of this book to anyone who showed even the slightest interest in it. I went on a “ghost tour” that took me on a walk late at night to visit the locations of some of the murders. It was on this tour that I learned about the “Moonlight Towers,” one of which stood at the end of the street where Mr. Oddbooks and I lived at the time, a nearly useless anachronism that seemed pointless to me until I learned their origin. Much of what I am going to share here is data I have rattling around in my brain, but I will include a list of links at the end of this article for those who may want to read more about this interesting case than just what I remember. The moniker “Servant Girl Annihilator” is actually both a flippant and misleading moniker for the person or persons behind the murders that occurred in Austin, Texas in 1884-1885. The name comes from a line William Sydney Porter, aka “O. Henry” put in a letter to a friend, describing the events in Austin in the summer of 1885. In a bitchy little comment worthy of Oscar Wilde, Porter snarked that Austin was terribly boring but the attacks from the “Servant Girl Annihilators” made things interesting at night. This moniker is misleading because men, boyfriends/common law husbands living with some of the female victims were also attacked, and because the last two women killed were not servants, but “respectable” married women. But most of the victims were indeed women and most of them were black servants. Here is a list of the victims, as well as what was done to them. Most readers of this site are hardy people, but if you are new here, the content that follows may be a bit upsetting. I was born in Dallas and have lived in Texas all my life. When I was a little girl, I can remember seeing “colored” entrances, restrooms and drinking fountains in older downtown buildings. Jim Crow was dead, in legalities at least, so no black person was forced into using these lesser amenities, but they had not been removed yet. In some places in older parts of Dallas, such reminders of the nastier parts of racial history in the USA weren’t remodeled or removed until the 1980s. I tell you all of this because while I was and still am aware that race relations in the USA are difficult, it was still… shocking when I began cemetery investigation and saw that segregation was enforced even in death. The slave and “colored” sections of “white” cemeteries were seldom maintained well, which is not particularly surprising. But I discovered that large chunks of history were lost in those slave and black sections of cemeteries, making even some of the simplest genealogy or historical research maddening, if not completely impossible. 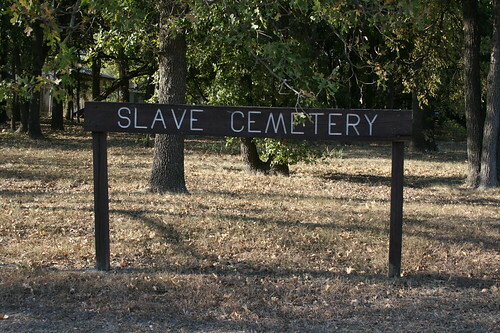 And there’s no way around this expression of sentimentality – often slave and Jim Crow cemeteries are sad places indeed. 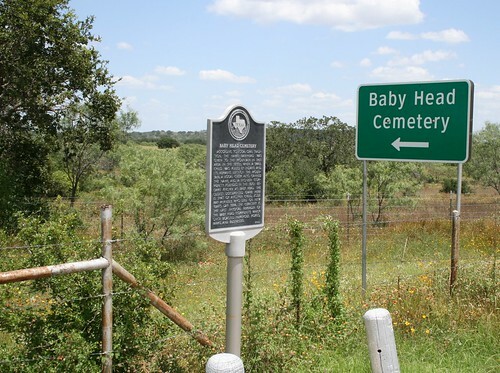 The first slave cemetery I found was in Round Rock Cemetery in Round Rock, Texas. I was there looking for the graves for some Old West villains and lawmen, and was startled when I saw it. Note that you can’t actually see any headstones beyond that sign. One day Mr. Oddbooks came home and told me about a cemetery near Jarrell, Texas that was evidently very interesting. It was located in a ghost town called Corn Hill. Old Corn Hill Cemetery boasts the graves of people of historical importance in Texas, so I wanted to check it out. Cemetery, ghost town, historical importance – what’s not to like? The problem was that the directions were so bad that I really think that had we closed our eyes and tried to get there by our sense of smell, we wouldn’t have ended up as lost as we became. It took us a couple of weekends to find Old Corn Hill Cemetery, but during the hunt we found a couple of very interesting mini-cemeteries, a derelict house where we totally trespassed and took pictures (I later learned that house is the James Shaver home, called the Old Stage Stop and Hotel), and all sorts of interesting fauna, mostly longhorn cattle. But we also found the Holy Trinity Catholic Cemetery, which has become the cemetery to beat for me in terms of symbology, statuary and emotional attachment. Holy Trinity Catholic Church is heavily Czech and the cemetery reflects it. I loved this cemetery not just because it was exotic to my austere Southern Baptist upbringing, but also because it was, quite literally, an education investigating the stones. Eventually my friend Barbora K., a resident in Slovakia, had to help me translate much of what is written on the stones. 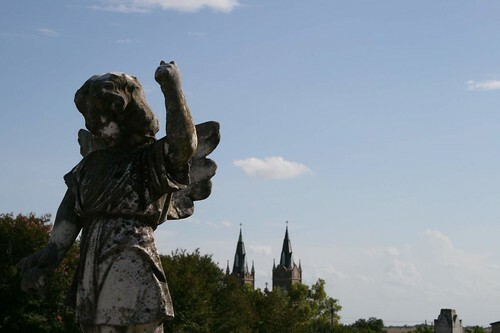 This cemetery was the gateway to me learning about the German, Moravian and Bohemian influences in Central Texas. It also taught me a lot about how cemeteries are arranged in Eastern Europe. Others feel strongly about this cemetery as well – I get at least one message a month from someone who finds my photos and wants to share their experiences with the church or ask if they can use some of my pictures. And I know this isn’t particularly spooky or Halloween-y, but cemeteries in the bright Texas sun simply cannot be creepy unless you’re out in the middle of nowhere near dusk. But there is still a somber, gloomy mood to this cemetery, especially when you get to the “babyland” section. The cemetery is a strange mix of dereliction and utter devotion because while many graves and statues have not held up in the Texas heat, every grave has been tended to by church members, even the ones where the stone is missing and all that is left are little metal markers so weathered the names were unreadable. The cemetery is grim yet comforting. I am not a particularly good photographer but this angry angel is one of my favorite pictures I’ve taken. You can see the church spires peeking behind the trees. In the summer of 2012, Mr. Oddbooks and I drove out to Baby Head, Texas. A real place. I swear. It’s a ghost town now, more or less incorporated into Llano, Texas, and Llano was a weird place in its own right. We drove around forever trying to find the remaining Baby Head post office and never found it. But we did find plenty of Apostolic churches, Cowboy Congregations, exotic animals being raised so weekend warriors can obliterate them with assault weapons on canned hunts, and several hidden little cemeteries that I really want to go back and investigate, as long as I can remember to wear steel-toed boots to repel all the grass burrs and fire ants. It’s hard to know if there is any truth to this legend. The tribe of the Indians who supposedly killed the baby is unknown, though if hard-pressed I would say it had to be Comanches, a pretty harsh tribe to be sure. The name of the baby is also officially unknown, but it is assumed to have been a little girl. I personally suspect the baby’s designated gender is because the oldest grave in the Baby Head Cemetery belongs to a little girl who died on New Year’s Day in 1884, though one local historian insisted her late husband knew people who searched for the child. The woman’s husband said the little girl was murdered in 1873, and that her name was Mary Elizabeth Buster. I have never been able to run to ground a Mary Elizabeth or a Mary Elizabeth Buster from Baby Head in 1873, but I also have a notoriously short attention span. This article by Dale Fry best illustrates all the stories about this Texas legend. 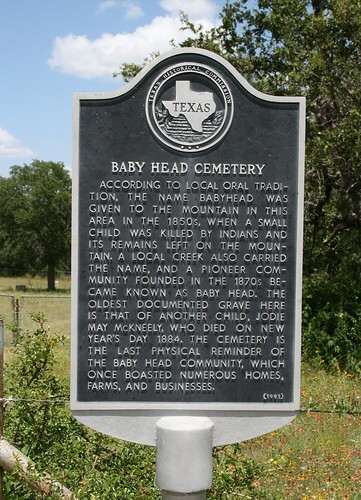 I had read several accounts of how creepy Baby Head Cemetery is. It wasn’t creepy. It was interesting, and sort of macabre in a very sunny way, but mostly it was painful. 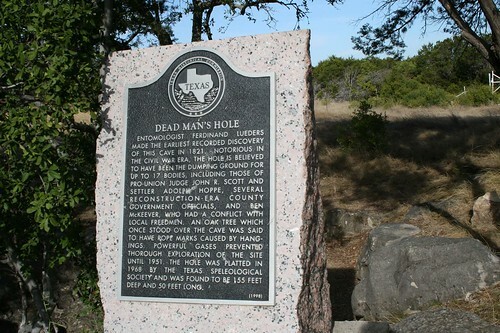 Up US 281 in Marble Falls, TX, there is a site called Dead Man’s Hole. Dead Man’s Hole is a natural limestone cave many ghost hunters insist is very haunted. It’s hard to rattle me and I self-identify as a skeptic. But even as I maintain that I am a skeptic, I have had strange experiences that I cannot fully explain. Some of those experiences involve what I call wrong places. A wrong place, simply enough, is a place wherein you feel something is not right. It’s a place where you feel uneasy and you don’t know why. If you probe your feelings long enough, you may find an answer that explains your uneasiness. The human mind perceives more than we process on a conscious level and sometimes our subconscious filters just enough to give us valid information that we may attribute to unseen sources, like the paranormal. I tend to think that was at play during my visit at Dead Man’s Hole, but, regardless the reason, Dead Man’s Hole is a wrong place. It is a place where so much human misery played out that even without any sort of paranormal interpretation many may feel uneasy here. The last time I was there I became so unnerved I likely will never return. I hope that despite the fact I was there during the brightness of the summer that the creepy nature of the place will show up in the pics. According to the Historical Marker on the site, an entomologist called Ferdinand Lueders discovered the hole, presumably in the course of searching out insects, but it was not until the Civil War that the cave gained it’s ghostly and ghastly reputation. The cave is quite deep, probably around 155 feet down, and is now capped to prevent accidents and, one suspects, potential vandalism. 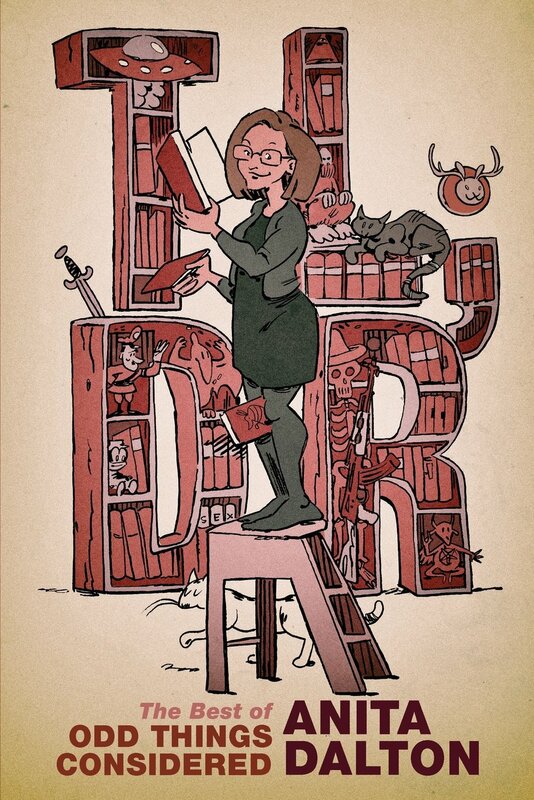 I Read Odd Books is going to change next year. Hopefully, if Mr. Oddbooks has the time to dink around with the site, I Read Odd Books will become Odd Things Considered. I’ve been in a state of extreme torpor over the last 18 months and it’s been hard to shake, but I am shaking it as of late and find myself wanting to write about more than just the odd and strange books I read. I’d like to speak of music, film, and strange travels and experiences and not have it feel contrived as I cram it all into a site devoted, ostensibly, to books. I also will incorporate the small amount of content from Houdini’s Revenge into this site. I intend to discuss strange ideas here, as well, but mostly I want to make sure all my analysis about the Boston Bombing stays online because I don’t know what I’d do without all the pointless abuse those entries have earned me. There was a time when I used to explore all the weirdness around me, and I want to get back into doing that. Driving to ghost towns, retracing the steps of serial killers, visiting places of strange historical significance. I would really like to start doing all of that again, and I hope creating Odd Things Considered will spur me on. In that spirit, during the days running up to Halloween I want to share some of the creepy and interesting things I’ve documented over the last few years. Some of it I may have spoken of here before, and, if I have, I beg your forbearance. Readers who followed me here from other venues may also remember some of this content. But while I don’t like repeating myself too often, it would also be nice for me to have all of it here, in one place, as this is the only real blog I maintain these days. So with all of that out of the way, I hope my experiment auditioning the concept of Odd Things Considered plays out well this week, and I also hope I manage to share some content that interests my readers. Stay tuned, first Halloween 2014 entry is coming up.